An original painting by Stanley Port. 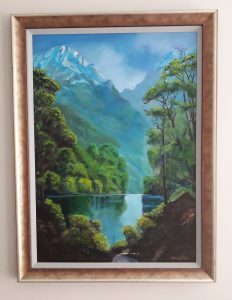 This is my painting of the awesome Doubtful Sound in South Island of New Zealand, a fjord in an almost untouched wilderness of majestic mountain peaks, sea inlets and luxuriant rainforest. This is claimed to be the second most popular of all the must-do tourist destinations in that country. My interest in painting landscapes such as this is because many visitors always want to buy a painting that will remind them of such an fantastic experience. Doubtful Sound is an imposing glacial fjord set in a remote location in the Fiordland National Park. It is impossible to drive to it as there is no connection to the national road network. Adventurous tourists from Queenstown or Te Anau need to get to Manapouri. Then they must join a tour that crosses Lake Manapouri by boat, passes over or visits the underground hydroelectric power station, take the coach over Wilmot Pass and descend to the end of Doubtful Sound. Having got there, take a day or overnight cruise on the Sound, also try kayaking or try spotting bottlenose dolphins, seals or even penguins. There are huge waterfalls such as Helene Falls at Deep Cove. Captain Cook was sailing past in the open sea in 1770. He saw the inlet, but decided that due to the local winds, it might be too dangerous to navigate it by sail – hence its name. There are still no settlements here within 200 km. The painting depicts the kind of scene that awaits the visitor, namely the snow-covered peaks and sea inlets that stretch far inland. The predominant colours, clear in the painting, are the forest greens and the blues of the water, sky and reflections off the snow. During a visit, I took numerous photos and made sketches, but the painting necessarily was created from these materials back in the studio. I used acrylic paint, a modern medium which is tough and super long-lasting. A view of the completed and framed painting that is currently for sale is shown below. I still have so much material, so maybe more paintings of the iconic scenery in this superb location will emerge in the future! If you want to see where Doubtful Sound is on a map, click MAP on the menu above.